You often can gauge your chicken's needs at a glance, just by noticing how she's breathing. Like other birds, your chicken usually breathes through her nostrils, but a healthy chicken may breathe with her mouth open to cool herself on a hot day. Breathing through the mouth can also signal stress or a respiratory problem. If your chicken's open-mouth breathing seems labored or is accompanied by respiratory noise, consult your veterinarian without delay. A bird's respiratory anatomy is different than that of a mammal, so causes and symptoms of respiratory disease in your chicken can be different from what you would see in your other pets. Chickens have air sacs that help move air into and out of the lungs. Mold or mildew in the coop can cause fungal infections of the air sacs that can compromise breathing. 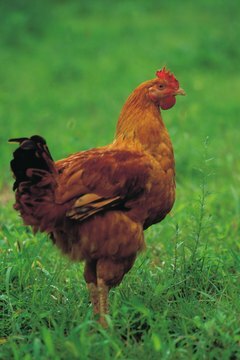 Chickens also have several hollow bones in their skeletons that are connected to the respiratory system. If one of these bones is broken, the chicken may have trouble breathing. A chicken does not have a diaphragm, so she can only move air in and out of her body by lifting her keel bone. Holding a chicken too tightly can prevent her keel from lifting and cause her to suffocate. A chicken may breathe rapidly through her mouth if she is very hot and trying to cool herself; she may also hold her wings away from her body. Make sure your coop has good airflow and ventilation to prevent overheating in warm weather. A vented ceiling and a small fan at ground level to keep air circulating through the coop will help keep your chickens cool. Always provide plenty of fresh, clean water. Your chicken may also breathe through her mouth from stress after she's been frightened by a dog or other predator. This panting should only continue for a short time, until she becomes less scared. Bacterial or fungal infections, viral diseases and parasitic diseases of the respiratory tract all can cause your chicken to breathe through her mouth. Stress from pain and inflammation in other body systems also can cause this symptom. Often, you may not notice illness in a chicken until it is advanced. By then it is difficult to treat, so it's important to make a point of checking your chicken's well-being regularly. Consult your veterinarian if you aren't sure your chicken's open-mouth breathing is normal. Disease that causes your chicken to breathe through her mouth is serious. Signs of illness in chickens include ruffled feathers, pale combs and loss of interest in food. You should treat your chicken's mouth breathing as a veterinary emergency if it is accompanied by respiratory noise, abdominal effort or a tail bob. Sneezing, runny eyes and repetitive yawning are additional signs of respiratory illness in chickens.